David and Cami may be in Box Hill, arguably the heart of Asian food outside of China Town in the CBD, but it is still a popular place for lunch or dinner. Particularly delicious are their Shanghai style dumplings called 'jiao-zi'; white pastry wrapped in various sorts of meat and chopped up vegetables. You can choose from fried, steamed and in soup; with fillings of chicken, beef, pork or prawn. These are inexpensive, with 15 steamed pork dumplings costing around $8 and 12 fried pork dumplings also around the same price. Provided at the table is vinegar and soya-sauce, which together with the dumplings intensify the flavour. Personally, I enjoy the pork dumplings the most, as I find the beef dumplings have an unusual taste, however I have friends who would disagree so it is worth trying all the different combinations. Also on the menu are soup noodles, fried noodles and various rice dishes. Usually the soup dishes are served very fast, within 5 minutes. However, the fried noodle dishes tend to be quite greasy, in particular the Shanghai Fried Noodles. Overall though, the Shanghai Fried Noodle is a great dish; thick udon noodles served with beef slices and bok choi. Side dishes include a 'spring onion pancake', known as 'cong you bing' in Chinese and also 'xiao long bao', which is a type of steamed bun, Shanghai style. 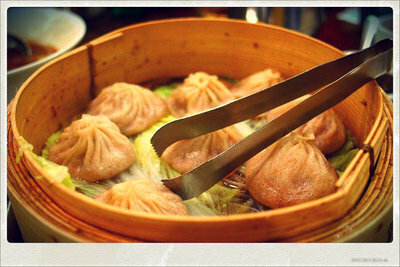 The 'xiao long bao' are my favourite dish, as they are more delicate and juicy than the dumplings. For those who try them though, be warned that the inside is deceivingly hot and be careful not to burn your tongue. Like most Asian restaurants, hot tea is provided in a thermos with chopsticks and cutlery already waiting on the table. Service quality varies, depending on the business of the restaurant, as during lunch hours the restaurant can become quite full. Overall, a great ambient place to eat with friends or family for a casual meal.